The Angel & Crown is tucked just off the cobbled high street in leafy Richmond. The pub reopened in December after an extensive refurbishment . Housed in a 400 year old building, the refurb has tastefully retained the character and charm of the building. There are rich colours, dark wood and even a private dining room with cosy fireplace. We went for the soup of the day (cauliflower) with artisan bread (£6) with a truffle oil drizzle. A rich, creamy offering with moreish bread that had great texture. 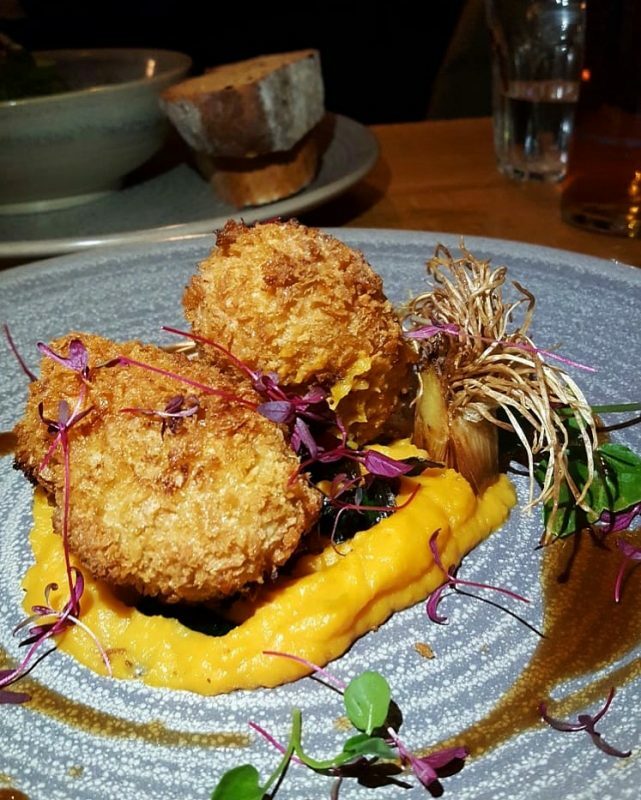 Our second choice, the Longbarrow pulled pork croquettes, braised leeks and sweet potato puree (£7.50) were seriously tender with a great crispy coating – a winning combination. 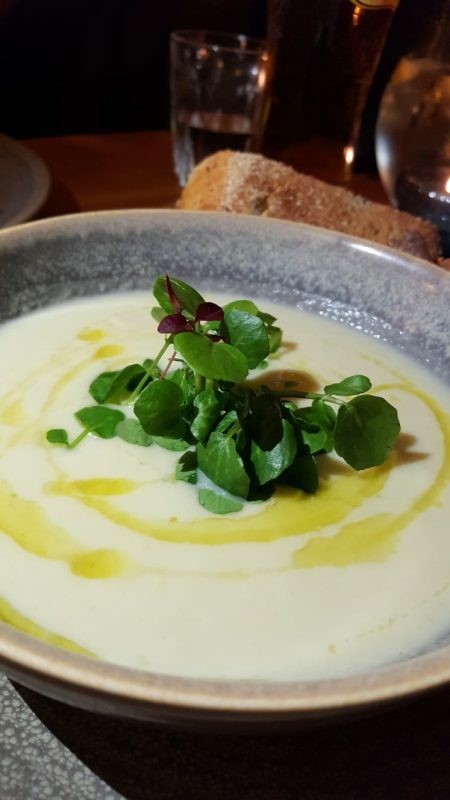 The hit of the puree and warmth of the leeks were a lovely addition to this great starter. There are a great selection of traditional hearty pub dishes with a good selection of vegetarian options. 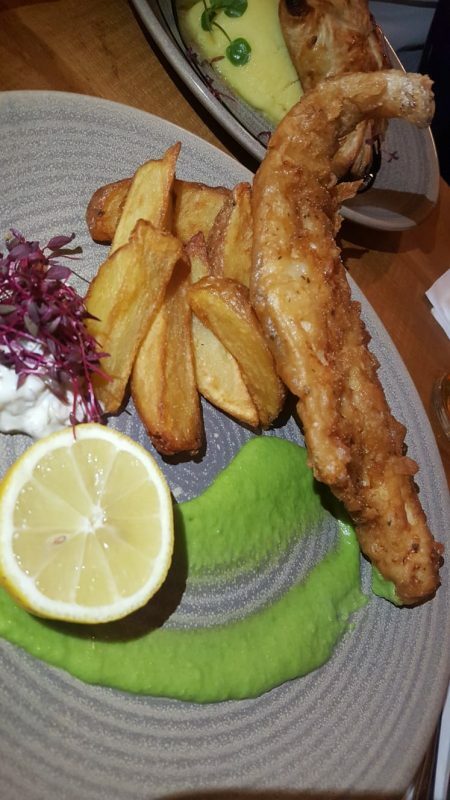 We opted for a traditional cider & herb battered North Sea haddock, skin on chips, tartare sauce and pea puree (£13). The batter was fabulously crisp on the fish and the tartare sauce was punchy, but the chips stole the show. Beautifully fluffy inside with great bite they were shared between the 2 of us and gone in an instant. We also sampled the Beef and London Pride pie, olive oil mash & winter veg (£14). The pie itself was a fabulously crisp parcel of pastry with a generous filling of tender, warming beef. It really was the perfect comfort food. 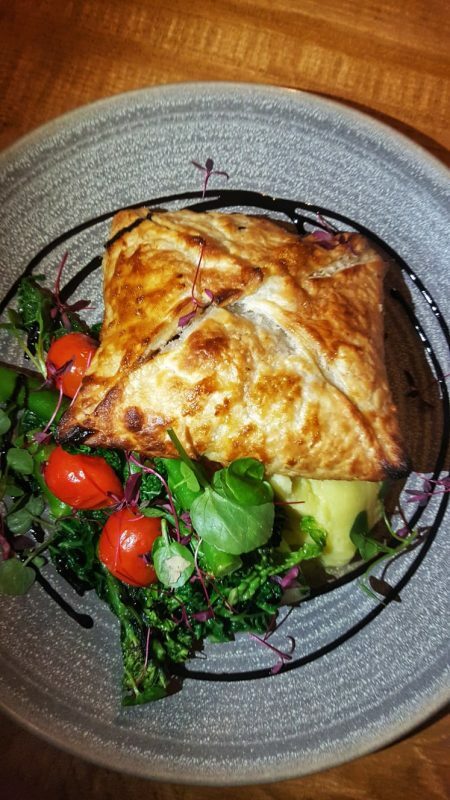 The creamy, smooth olive oil mash combined with the roasted cherry tomatoes and veg bought a lightness and pop of freshness balancing the classic pie very well. Despite the generous portions that had come before leaving us fairly full,the high bar set by the previous dishes meant we had to dip into the dessert menu. We tried the sticky toffee pudding (£7.50) and the Bramley apple & tangerine crumble (£6). The crumble was served with a creme anglaise on the side. I’ve always thought you can’t go wrong with a crumble but didn’t know it could be this right – the tangerine added a wonderful freshness and lift to the familiar tang of apples, a lovely twist on a classic. 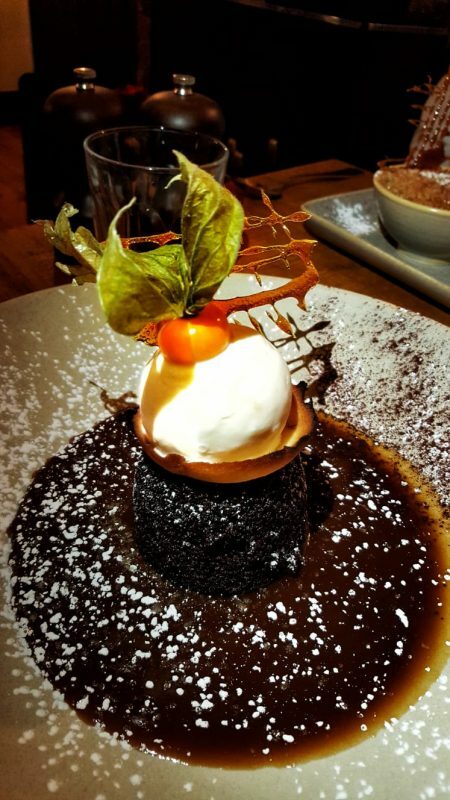 The toffee pud was gorgeously sticky with an oozy, sweet melt in your mouth sauce. Served with honeycomb ice cream and a crispy tuille underneath which added wonderful bite to the softer textures. Both desserts were presented lovingly with additions of caramel shards adding a tasty crunch. These are rich, comforting desserts with a little decadence. We were seriously impressed with the standards of fare offered at the Angel & Crown restaurant in Richmiond. Chef Geo Bassani at the helm here is rated as one of the UK’s TOP 50 chefs so it really shouldn’t be a surprise that this was a thoroughly enjoyable meal! For traditional pub fans the Angel & Crown is a delight, ticking all the boxes of a quality establishment. 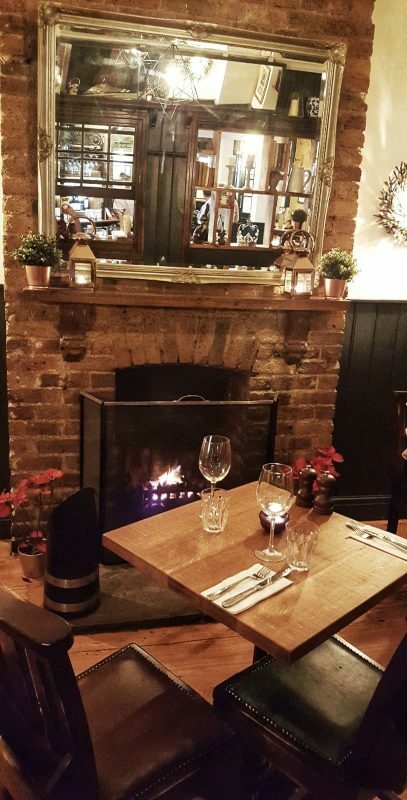 Whether you live West or fancy a pit stop post river walks or checking out deer in Richmond Park, the Angel & Crown is sure to see you right with excellent traditional high quality British cooking kicked up a notch.